As an IT service provider you want to centrally record details about clients, end users of clients, prospects, suppliers, other relations, employees, contracts, products and services catalogues (PSCs) and forecasts. But if your IT department offers its services to ‘internal clients’, then you get as much benefit from Gensys CRM as an external service provider. Use contact and employee details to guide the IT management. Stay in control of the contracts with your clients, from your clients and with your suppliers. Manage leads and opportunities. Record all contacts with your clients or prospects. 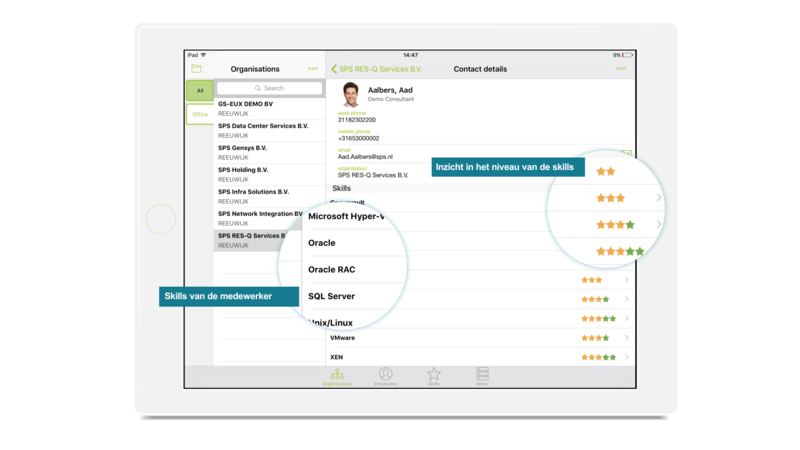 Record ‘skills’, certificates and contact details for employees, and perhaps those of your clients as well, in Gensys CRM. Gensys uses these details as control information, for instance to assign tickets. The contact details of your employees and those of your clients are also used for standby services. Your client even has access to some of the contact details of your staff, but only if you have assigned the rights for this. Stay in control of the contracts with your clients, from your clients and with your suppliers through recording in Gensys CRM. Gensys CRM has a unique contracts database with agreements with clients and suppliers. What is unique is the relationship between the client and suppliers to the client with one or more contracts. This means you can know exactly which supplier you can approach for what and under which conditions and agreements for your client. Enhance the effectiveness of the marketing activities through standard workflows with tasks to be performed. Sales staff maintain the overview by recording activities and ‘tasks’ per lead or opportunity. Your marketing and sales efforts give rise to a forecast and you and your salesperson manage the forecast with Gensys CRM. Need an insight into the (anticipated) sales of your products and services (your PSC)? Clear reports provide that.